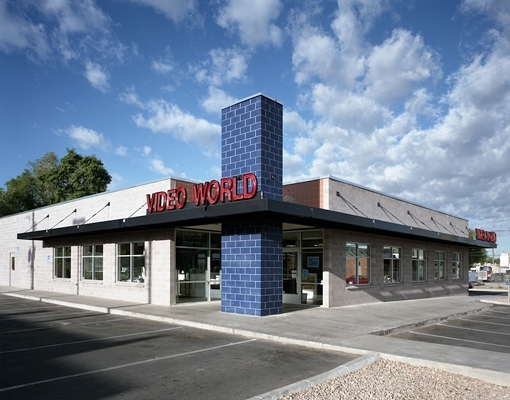 Color and the straightforward use of materials distinguish this 6000-square-foot retail building located in Albuquerque’s Nob Hill neighborhood. A dark blue pre-glazed masonry tower announces the entry and calls attention to the building from Central Avenue. The contrasting color of ceramic tile which clads the parapet above the glass curtain wall further dramatizes the entry. Both the tower and this entry notch are illuminated at night. The building is simple and smart in the design attention it pays to the importance of entry and signs. The perimeter canopy functions as a marquee to a successful retail enterprise.